Are you an Android smartphone user? Do you use Instagram (or Vine?) but couldn’t use its video feature (What?! There is one?) because it’s not available? 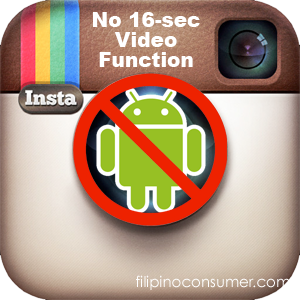 Don’t you wish you could use that 16-second video function on Instagram (by Facebook), MixBit (by YouTube), and Vine (by Twitter) and share it with your friends? Isn’t a waste that most functions of these apps Filipinos use are only made available on iOS or on an iPhone, iPad. Android users have limited use on them and frankly they’re missing a lot of fans from The Philippines. The Selfiest Nation in the World is 30 Million Facebook-fan strong and Instagram should be taking advantage of this because Filipinos loves to express themselves on the Internet – but they’re not, so are YouTube’s founders (MixBit) and Twitter’s (Vine). I feel that the growth is becoming faster than the supply. It is getting close to the point that Filipinos are always on the receiving end of each app rather than the origin. And it’s an anomaly that we’re called creative when we can’t develop apps that are naturally akin to the needs and wants of our countrymen. Where are the app developers when there are so many potential users? I don’t mean to rant but this country is not lacking in talent. It’s lacking in strength, courage, and sacrifice is what I perceive. With this data, it’s high time we act and dream big because if we’re talking about consumers or market for the app we want to sell, we have a lot: at least 4 Million of them. Now, sacrifices are necessary but this will definitely reap dividends later if we will only pursue our dreams like there’s no tomorrow and stop whining about our government or contended with just playing Candy Crush, Angry Birds, etc. Why not be the one to invent games? Just look at the sample data we computed. It’s time to turn Fantasy into reality. How many smartphones do we have in the philippines? How many smartphone users are there in the philippines? How many Filipinos are Facebook fans? Here’s a good video review I saw on YouTube that demonstrates what Google Glass is. Tim Schofield, demonstrating Google Glass 2.0 (Explorer or Experimental version) will give you a close encounter on this new form factor that will change the way we view our digital world. Form factors are usually the hardware we use to operate our operating systems other than our smartphones and tablets. No longer will we need our phones to take pictures, record videos, or search maps, Google Glass will do it for you. Google Glass will run with more features tethered on your communication gadgets. Watch and tell us how much you’re willing to pay for such a gadget, Google touts would cost around US$1,200 a pop. Enjoy the video and get ready for new gadgets to come. Much thanks to Tim Schofield. Awesome isn’t it? 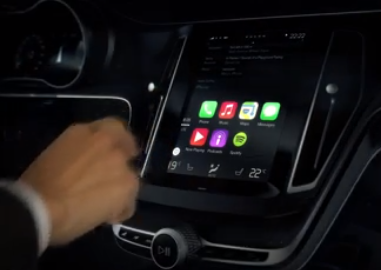 This online and dashboard entertainment system is called Apple CarPlay. 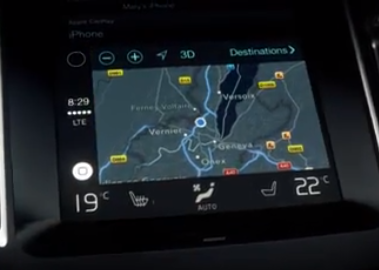 Aside from Mercedes Benz, Volvo, and Ferrari, CarPlay will also be available in Honda and Hyundai cars. This is certainly a big hurrah for a lot of Apple users (and stockholders! ), who according to Apple’s demographics are the ones that are influential and manages their own businesses — but not The Philippines. Apple users here are more likely wanting it for social status. Every Apple fan would really, as an expression, starve themselves to death just to be able to have an iPhone. In fact, whatever data Apple HQ in Silicon Valley has cannot be compared “apples to apples” (no pun) with the market it has in The Philippines, which brings me to my post as to why Apple CarPlay won’t work as well in The Philippines as Apple-US may tout it to be globally. Now, the reasons here is geographically and culturally related so I don’t expect this to be the same for other regions like Europe, The Middle East, of even in Southeast Asia. Expect posh village residents to think twice in letting their drivers use that sleek Volvo or would they? The traffic in Manila is horrendous and those who can afford a driver would rather have someone drive them around but then again, no…this is perplexing. First is good but is Android far behind? 91% of Smartphones sold in The Philippines run on Android and therefore you have a pretty small margin to sell a car that carries Carplay. Android has majority hold of this country and also of America and how. Local mobile phone brands like Cherry Mobile, Star Mobile, myPhone, and others that are cashing it in, focusing on the ‘masa’ (lit. mass) market who can dish out a smartphone that sells for as low as US$40.00, Jelly Bean or even Kitkat OS to boot. Where’s iOS? Ask Android. Carplay will run Siri but like other posts that have reviewed the voice-operated system, it can only understand the American accent that Filipinos sometimes overdue or says it with such a hard tongue. Blame it on our teachers who pronounces the vowels only as “aahhh” “eh” “eeeee” “o” and “oooooo” and by the way, have I told you that our Visayan accent can also get in the way? This will really make a lot of iPhone fans in the Philippines go postal (go mad crazy) because if you know the Filipinos culture, if it ain’t broken, continue to use it because you bought it with hard-earned money and mostly the problem is with Apple who always come up with new models every one or two years. Who has iPhone 5? Not all has it because such a novelty phone is hot on thieves lurking in the dark looking for the next victim. Might as well get a phone that no one will dare steal, right? Android boasts of publishers that will offer free apps or even ones that are bought at an affordable price. On the side of using Apple’s Maps, it still has a lot of catching up to do with its competitor Google Maps and the biggest letdown of all is that The Philippines has yet to be included in its 3D view or even to its service. Expect Apple Carplay to hit our shores in probably three-years time when they finally map our country providing accurate information and when they finally have an alternative for Siri that can understand Filipino-English. For now, though it plans to launch in Honda and Hyundai cars (aside from Volvo and Ferrari), I don’t expect that such a feature will be launched in The Philippines some time very soon. Nonetheless, it’s an innovation worth waiting for, which I’m sure Google is looking at intently and waiting for blogs like mine to show Apple’s Achilles Heels and create a similar infotainment system that can be more than just a dashboard screen or tablet but something an owner can control from the back of the driver’s seat and enjoy. Thinking about buying the latest iPad? Are you thinking twice? Rumors have it that an iPhone 5 is coming out in September. Why suffer anxiety? It’s not worth it and feel guilty at the same time. 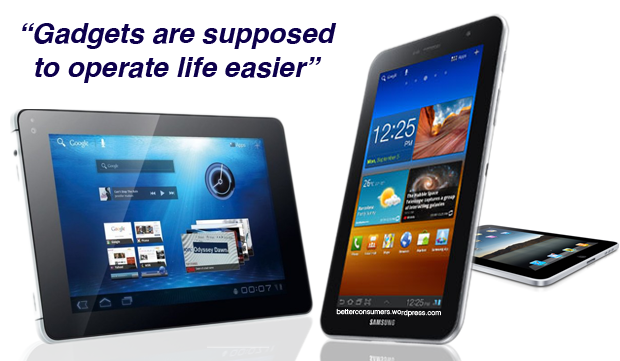 Gadgets are supposed to operate life easier (if not complicated!) and getting one should not be complicated – if you do your research. I bought a Samsung Galaxy Tab 7.0 Plus even after an office-full of peers are telling me to buy an iPad. What’s with all the fad? The fuss? The pressure? Price – Why spend Php27,000 (US$629) when today’s gadget gets antiquated after two years? I’m more comfortable shelling out Php23,000 (or lower at times!) without having to worry if it gets old in three years. I’ll be more than happy it will reach more than three years before I buy a new tablet. Features – All of Samsung’s and Huawei’s 7-inch ‘pads are 3G-ready, SD Card-ready, and has this killer function called, “Swype” that Apple is trying to replicate. Yes, iPhone 4s has Siri but if you don’t have a western accent then Siri doesn’t know you. Sad. Variety – so many brands to choose from: Samsung, HTC, Huawei, Amazon’s Kindle Fire, Acer’s Iconia, Asus’ Eee, and a lot more others. Bottomline: Practically speaking, if your ending salary (net of your monthly commitments and bills) is thirty grand (US$700), buy an iPad (4G version). Me? I need not look further. I checked my loved ones, I checked my wallet, and I checked out my pride. If my reason is to just get on the bandwagon, then I should ask what else I can do with my Php27,000? Heck, I could probably wait for a little longer and get myself to the fifty thousand mark. By then it wouldn’t hurt to get a gadget with that price without denting my savings that much. I chose not to ride the bandwagon. I checked my lifestyle and realized if a tablet is for me because a Notebook, a Laptop, or even a startup Smartphone would do just fine – for now.